Fluid Powered TYPO3 FLUX Fluidcontent - No Output in Frontend? I've made a TYPO3-Installation 6.2.9 with Fluid powered TYPO3 - the first steps with the Pre-configured Distribution "Site" were fine. My Site/Page-Template is installed and I added all the TypoScript stuff. Now I want to use FLUIDCONTENT (FCE) with FLUX. I've added a new Template-File TeaserOne.html and I try to use the Layout from the Distribution Content.html. 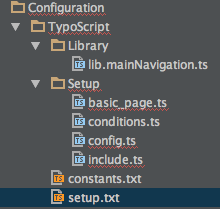 Now I can see and write into my input-fields in Backend, but I've no Output in Frontend?! What else do I need? I only see the Content-Element Headline. Not the FLEXform. I'm using the latest Versions of flux (7.1.2), fluidpages (3.1.2), fluidcontent (4.1.1), fluid_core (1.0.2) and vhs (2.1.4). The static template "fluidcontent_core" was included via pre-configured Distribution. Not the answer you're looking for? Browse other questions tagged output typo3 frontend fluid flux or ask your own question. 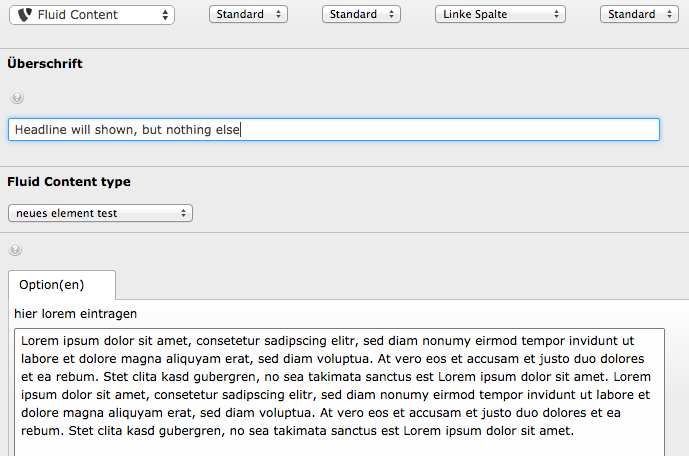 FluidTYPO3: How do I render content from other extensions (news…)? FluidTYPO3 vhs ViewHelper for SVG Images?